By now you know the name, but you don't know how close you came to never hearing about him. 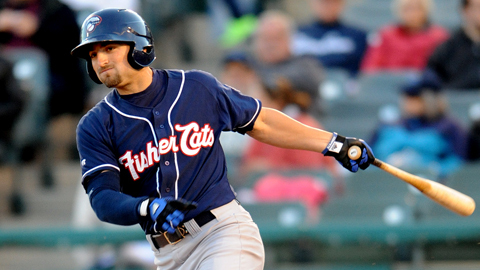 Kevin Pillar was the Blue Jays 32nd round draft pick in 2011 out of Division II Call State-Dominguez Hills. The school was founded in 1960, and the most successful of the five major leaguers to come out of the school is Craig Grebeck, who was a backup infielder for 12 years. Pillar is hoping to change that. He grew up playing every sport imaginable, from the regulars like basketball and football, to the uncommon ones like motocross and roller hockey. A California boy his whole life, he went to a Catholic high school that was not a baseball powerhouse. Despite being one of the best players on that team, he was still not a prospect, which explains how he didn't end up at a top flight baseball school. However, he would get his first bit of good luck near graduation. "I didn't have anywhere else to go," Pillar said about attending college to play baseball. "Luckily, my high school coach accepted the job as pitching coach at Dominguez Hills." And that's how the door opened for him to continue his baseball career. Once he got to college ball, he began to put up good numbers, but nothing overly spectacular. He was cruising along in his junior year, when he put together a mini hit streak. That mini hit streak extended to a fairly good hit streak. But then it continued to a terrific streak. Only when it started to reach historic levels - eventually 54 consecutive games - did people begin to notice not just the player, but the school as a whole. This was his second bit of good luck. "I was an unknown at a small school, but (the hitting streak) helped get me drafted." When asked if he thought it was the ONLY reason he got drafted, Pillar replied, "I'd like to think not, but in reality, it might have been." But here he is, one of the most consistent hitters in the entire Eastern League all season, as well as a tremendous defensive outfielder with great instincts, a powerful and accurate throwing arm, and plenty of speed on the base paths. How did he get here, aside from the usual "hard work/good mentality" philosophy? "My parents, Mike and Wendy," he answered. "If they could, they'd rent an apartment (in the Manchester area) and come to every game. They'd follow the bus on road trips." But, since they are still living in California, they listen to every game on the air. He also notes that they haven't missed "more than ten games" from t-ball through his college days, but that obviously changed once he became a professional. "And it kills them," he adds. However, you can't overlook the "hard work/ good mentality" philosophy, especially with him. "You can't judge intangibles," he says, meaning if you have a good mental makeup and the heart to play the game, you will put up good numbers. And it's the good numbers that get noticed by scouts, whether they're college scouts or professional. "I use (being a low draft pick) as motivation." That motivation is what could carry him right to Toronto someday. But as if that wasn't enough, he has another reason to push for the major leagues. "I promised my fiancée Amanda that we would get married when I made it to the big leagues." Don't let it get lost on you that he said "when," not "if."